Well it seems mother nature is beginning the process of acknowledging spring – now that it’s almost April. So at least the trend is headed in the right direction. I’m referring to the marginal severe weather setups that have occurred over Texas, Oklahoma and Nebraska over the past couple days, producing large hail and damaging winds. There were even a few tornado reports in Nebraska. I’m kinda being sarcastic since all this pattern can produce is marginal garbage. But being serious for a moment – just seeing actual supercells on radar after the winter-like March we’ve had really helps to sort of mentally kick start the brain into storm chasing mode. What it really does is gets storm chasers excited about the upcoming season. After how slow March has been I can only imagine how anxious some chasers are right now to get out there during a big tornado setup. But all joking aside, I do think the trend is headed in the right direction. The high latitude blocking that has brought such cold temperatures for nearly a month is weakening. Low level moisture over the Gulf of Mexico is recovering and April is almost upon us. Things will turn around before you know it and then we’ll all have a lot more to talk about. Gilbert, Iowa tornado caught by Jim Bishop on November 12, 2005 during the largest November tornado outbreak in Iowa history. Even during slow tornado seasons there is usually one or two big tornado outbreaks, at least at some point. I mean, you can look at tornado statistics all day long. But when large scale weather patterns change in the spring, it typically involves bringing together a lot of low level moisture with cold air aloft and in turn, strong wind shear. In the end large severe weather outbreaks tend to unfold at least once or twice throughout the spring or summer, regardless of how terrible the pattern or atmospheric conditions have been, or even how the overall season turns out. Remember, mother nature does not care what the calendar says or how many tornadoes have occurred in a year. Things just happen when the conditions come together. Speaking of tornado outbreaks during slow tornado seasons, one very interesting case comes to mind. 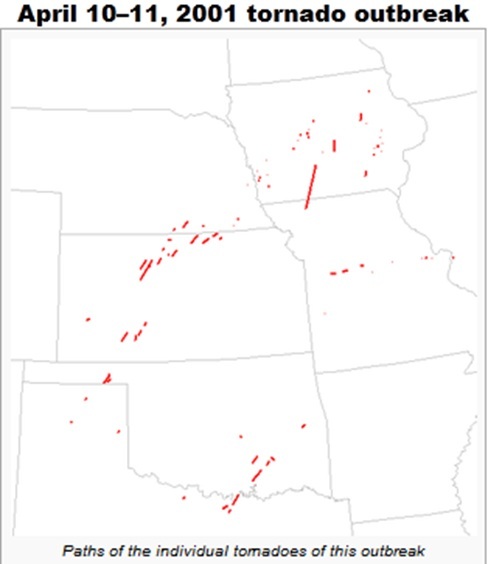 The April 10-11 tornado outbreak that spawned tornadoes from north Texas, through Oklahoma and Kansas, all the way up to Iowa. All told, 79 tornadoes occurred during this two day event (See image below). But what really grabbed my attention was the number of tornadoes in the state of Iowa alone – 28! And all of them occurred on April 11, making it the largest one day tornado event in the state of Iowa. This broke the old record for most tornadoes in one day in the state of Iowa set during the Mother’s Day Outbreak on May 8, 1988. And is it just an odd coincidence that 1988 was also a slow year for tornadoes? April 10-11, 2001 Tornado Outbreak with tornado paths shown in red. So it’s just kind of interesting that during a slow tornado season a huge outbreak occurs and breaks a single day tornado record for the state of Iowa. It just proves that sometimes big outbreaks happen, and it doesn’t necessarily mean anything at all for the remainder of the season. It’s simply an outbreak that occurred, nothing more. And another thing, 1988 was a major drought year for a large portion of the U.S., including the Great Plains. 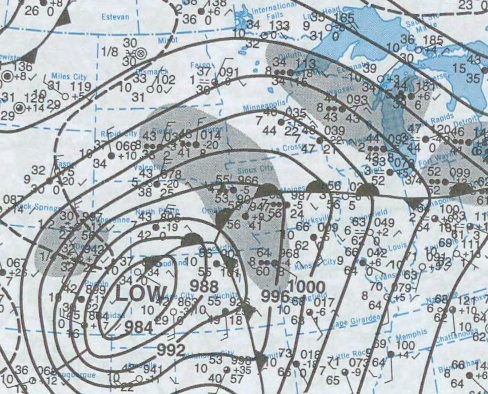 This isn’t even something I was necessarily looking for, but in finding this April outbreak in 2001 I saw the statistics for the 1988 Mother’s Day Outbreak in Iowa. In my previous post I mentioned how widespread and severe the current drought is over the central U.S., namely the Great Plains. So again, quite the interesting find. Coincidence? I think the point in all of this, if there’s a point in all my rambling, is that sometimes you just have to be out chasing on the one or two big tornado days of the season. If you’re not, then you will probably miss out of photogenic tornadoes. This isn’t always true. I’ve seen plenty of low risk setups produce beautiful tornadoes. But sometimes during a slow tornado season you just have to be out there on the big days or wait ’till the fall or the next spring. The tornado season and naturally, the storm chasing season, has been very slow to start. In fact for all intents and purposes we have yet to see a true beginning to the season. Usually by late March storm chasers have already had their first half decent chase day of the season, or are anxiously looking forward to a severe weather setup in the near future. Not this year. Instead, winter decided to show up in March and hasn’t given up yet! Since the middle of March, high latitude blocking associated with the negative phase of the Arctic Oscillation has been at historically low levels. Looking back over the past 40 years, only a few other years had Arctic Oscillation values during the month of March at such low levels! 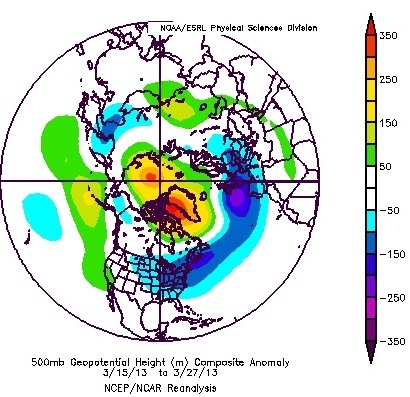 Below is a hemispheric plot of 500mb height anomalies from March 15 to March 27 of this year. As you can see, strong height anomalies are located from over the north pole to Greenland, associated with the Arctic Oscillation as well as the North Atlantic Oscillation. Also notice the below normal height anomalies over the eastern half of the U.S. This has been instrumental in keeping temperatures cold and has sure made it difficult for severe weather to occur across the plains states. On top of the slow start to the tornado season, we have what’s becoming a widespread and quite severe drought across nearly the entire Great Plains region. 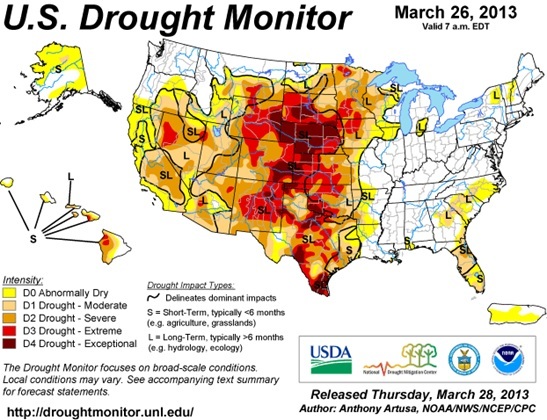 Below you can see the latest U.S. drought monitor as of March 26, 2013. A severe drought covers almost the entire plains regions, but some areas of the central and southern plains are in extreme drought conditions. Some are even at exceptional levels – the worst level of drought we have on the scale. And the outlook isn’t great. In fact it’s not good at all, it’s actually bad news for the long term future of the tornado season this year. The expectations are for a continued drought over the southern and central plains. The only areas that show signs of possible improvements are across the northern plains. The one good thing I can say is it’s late March and there’s still time for some of these trends to turn around. April can a lot of times bring much needed improvements before the peak of the season really kicks into high gear. So let’s hope that happens..but I’m not holding my breath. 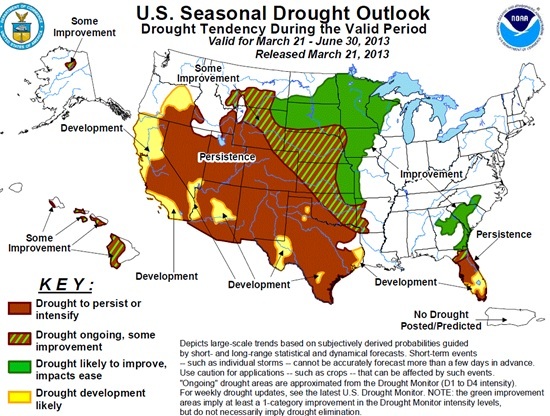 Current U.S. drought outlook through June 30, 2013, created March 21, 2013. Even with these totally negative trends, there will be tornadoes. There always are, even in the worst seasons. It’s simply a matter of going storm chasing when those severe weather setups unfold, because the atmosphere is doing it’s best (or worst!) to keep severe weather and tornadoes from occurring! Though from what I’m seeing right now I’d bet on the bulk of the tornadoes this season occurring before the back half of May. I also think when we do come out of this never ending winter pattern that the chase season will start fast, like someone suddenly turned on a light and it’s go time. What I’m saying is the transition from this winter like pattern to spring will be dramatic, and that could involve severe weather if the right conditions come together. But I also don’t think it will last all that long before the drought and other factors like ENSO and other Pacific signals fight back as mother nature wakes up again…or goes back to sleep, depending on your point of view.